Home ShinChan Movie: IN Hindi Full (HD) Shinchan Bungle In The Jungle Hindi Movie! 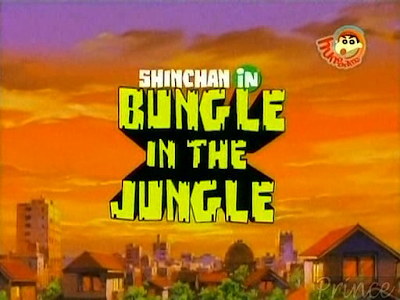 Shinchan Bungle In The Jungle Hindi Movie! Story : Shinchan in BUNGLE IN THE JUNGLE follows the adventures of Shinchan, his family and friends as they hop on board a cruise for a South China Sea Trip with his idol Action Kamen. But they hit upon rough seas when a group of monkeys kidnap all the adults including Action Kamen as slaves for the self proclaimed ruler of the jungle - Paradise King!